Benefit 4 Nathanial Zimet | Please keep Nathanial's recovery in your thoughts and prayers. THANK YOU FOR VISITING THIS WEBSITE TO FIND OUT HOW YOU CAN HELP CHEF NATHANIAL ZIMET. THIS WEBSITE WILL SERVES AS A CENTRALIZED POSTING FOR BENEFIT EFFORTS GOING ON AROUND THE CITY OF NEW ORLEANS. As many of you know, Nathanial Zimet (chef/owner of Boucherie and The Cue Crawl), was the victim of an armed robbery attack in the early morning of Sunday, May 22, 2011. He is currently recovering from serious, but non-life threatening gunshot wounds. Although Nathanial is expected to make a full recovery, he faces a hard road ahead. Unfortunately, Nathanial is without health insurance and faces mounting hospital bills. Any bit of support from friends and the community will be the key towards a successful recovery. In a way, the entire community is affected by such a senseless crime and random act of violence. It will be a healing process and this website serves as a means of healing by providing information on what you can do to help. Numerous restaurants around town are offering to donate a form of sales proceeds to Nathanial’s Fund and attending these restaurant events will help us all in the road to recovery, but most of all it will help our dear friend Nathanial. Any benefits that are organized will be posted here as well. 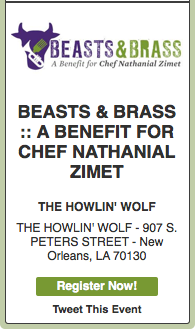 Please see details below for the primary benefit, BEASTS & BRASS, taking place on Sunday, July 10 @ The Howlin’ Wolf. Incredible thanks to all those helping to make the benefit happen, especially Howie Kaplan with The Howlin’ Wolf. Nathanial has given so much to this community by means of participating in various fundraisers throughout the years. He has donated his time, energy and amazing food to these events because he believes in giving back to the community, he believes in New Orleans. It is time we help Nathanial in this critical time of need. IF YOU WOULD LIKE US TO POST A NOTICE ABOUT YOUR RESTAURANT OR BUSINESS’ EFFORTS TO DONATE SALES PROCEEDS, PLEASE EMAIL THE INFO TO BENEFIT4NATHANIAL@GMAIL.COM SO WE CAN SPREAD THE WORD. BEASTS & BRASS :: A BENEFIT FOR CHEF NATHANIAL ZIMET ~ JULY 10, 2011 @ THE HOWLIN’ WOLF. For more information and to purchase tickets, please visit www.benefit4nathanial.eventbrite.com. If you would like to participate, please email benefit4nathanial@gmail.com. BEERS NOT BULLERS BENEFIT – JUNE 24, 2011 – NOLA BREWING COMPANY – For more information and to purchase tickets, please visit www.beersnotbullets.eventbrite.com. CHEF MICHAEL OF http://www.chefsformammograms.com – THRU JUNE – $5 WILL BE DONATED FOR EVERY 4 BOXES OF LOUISIANA PECAN GRANOLA ORDERED WITH FREE SHIPPING. Visit his website for more info! PIZZA DELICIOUS – THURSDAY, MAY 26 and SUNDAY, MAY 29 – DONATED 20% OF SALES & 100% OF TIPS. Place you order by calling (504)676-8482. For more info visit http://pizzadelicious.blogspot.com/. TACEAUX LOCEAUX – SATURDAY, MAY 28 and SUNDAY, MAY 29 – DONATED A PORTION OF ALL SALES FROM THEIR TACEAUX TRUCK. Saturday night they will be at Dos Hefes Uptown. CURE NEW ORLEANS – SUNDAY, MAY 30, 2011 THRU SUNDAY, JUNE 5, 2011 – PROCEEDS WERE DONATED FROM THEIR PUNCH SALES! 4905 Freret Street.www.curenola.com. PARASOLS BAR & RESTAURANT – MONDAY, JUNE 20, 2011 – 7pm to 10pm – Proceeds were donated from their bar and food sales! You can click the button below to donate to the Nathanial J. Zimet Fund. Its through Paypal, so its easy, and every dollar helps. Will there be a silent auction? If so, I’d love to donate an item for auction. I’d also be happy to help with the fundraiser. Just let me know. I’ve been so freaked out about this horrific situation. I will keep praying for him.